Looking for a boozy dessert for your next party? You are going to LOVE this one! Red velvet cake spiked with spiced bourbon whiskey will be the biggest hit at your party or the best dessert at that party you’re planning to attend! 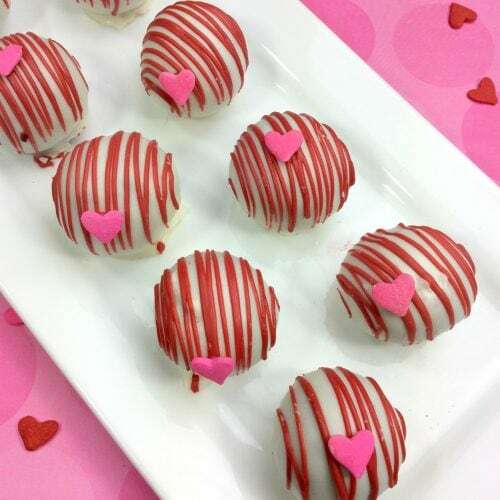 With Valentine’s Day just around the corner, these would be a huge hit for a Valentine’s Day party. 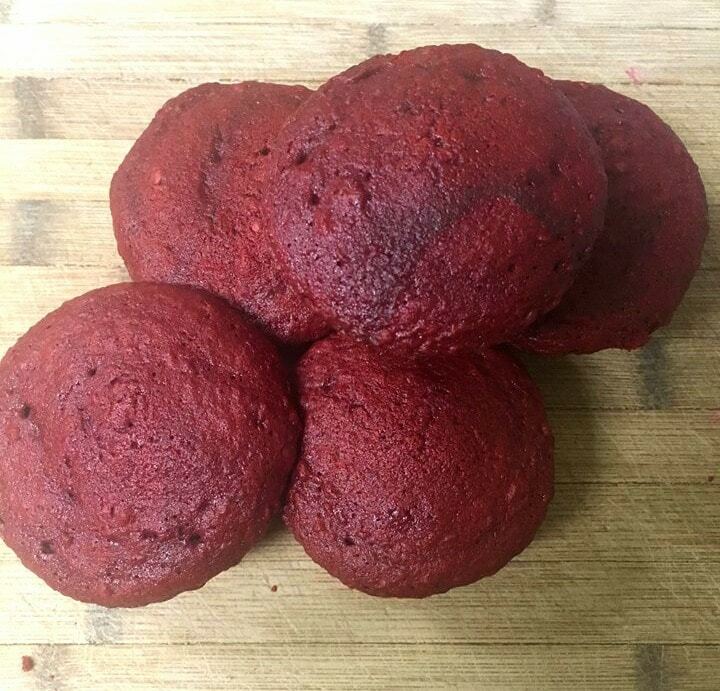 But the red velvet cake balls would also be perfect for a Christmas gathering – just eliminate the heart. You could use white chocolate for a wedding or New Year’s Eve. The possibilities are endless! Prepare cake batter as directed on the back of the box. The box will make about 24 cupcakes. Mix in the 2 Tbsp of the spiced bourbon whiskey. 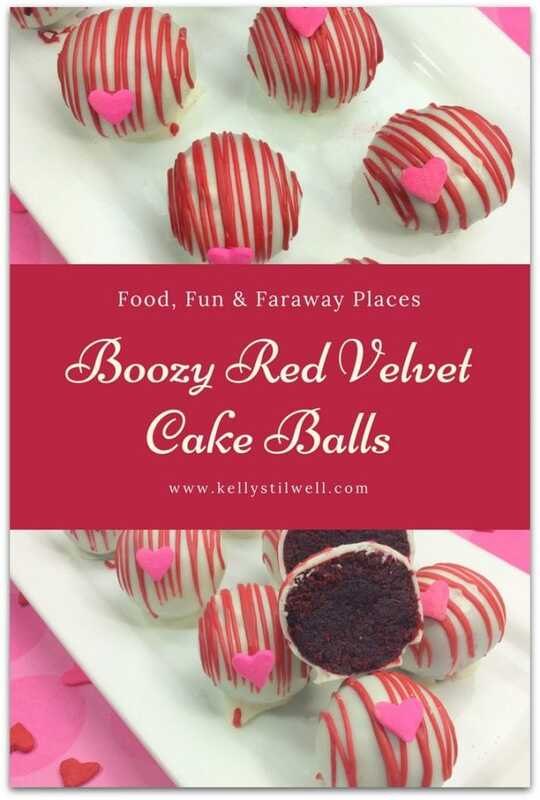 If you don’t want the cake balls to be a boozy dessert, just leave this out. Scoop batter into cupcake liners and bake for 21 minutes. Once cupcakes have been baked and cooled, peel bake the cupcake liners on 10 cupcakes. Doing only a few cupcakes at a time, Crumble the cupcakes using your hand into a large mixing bowl. Crumble only about 10 cupcakes for 48 cake balls. You will have cupcakes left over unless you want to make more cake balls. Add in about 3 tablespoons of the chocolate frosting. Using your hand, or a wooden spoon, mix until combined and you have a dough-like texture. Using a small ice cream scoop or a tablespoon, place a scoop of the mixture into your hands and roll into a ball. Place ball on the cookie sheet. Once all of the dough has been rolled into balls place into the fridge for 20 minutes or freezer for 10 minutes. Using a double boiler, melt the chocolate until smooth. 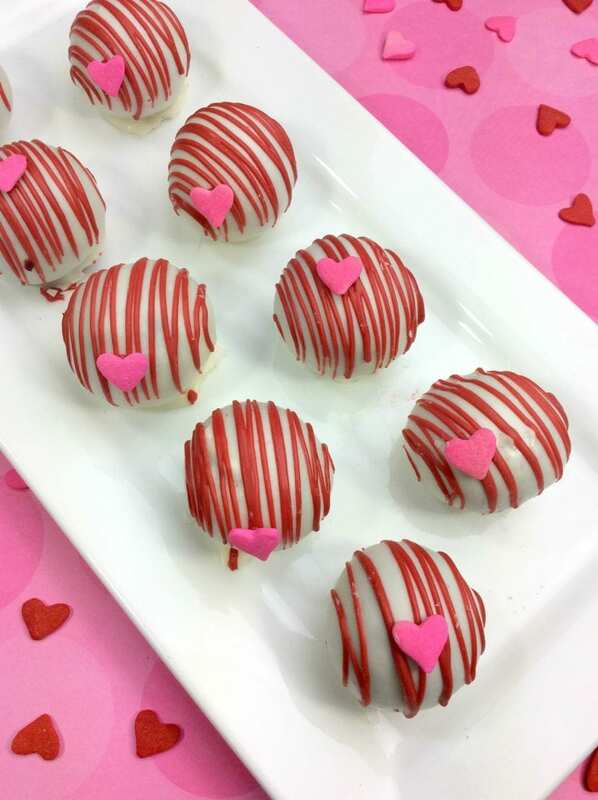 Once your cake balls have hardened, using a fork and butter knife, dip a cake ball into the melted chocolate and fully coat it. Use the fork to scoop up the cake ball and lightly tap the edge of the pot. Place cake ball onto the cookie sheet. Repeat previous steps until all cake balls have been rolled and dipped. Set aside for the chocolate to completely cool. Wash out your double boiler and dry very well. If you’ve worked with chocolate before, you know water will change how it reacts. Pour about 1/4 of the red candy melts into the double boiler. Wait a few minutes and then mix with a spatula until smooth. Pour melted candy melts into the piping bag. 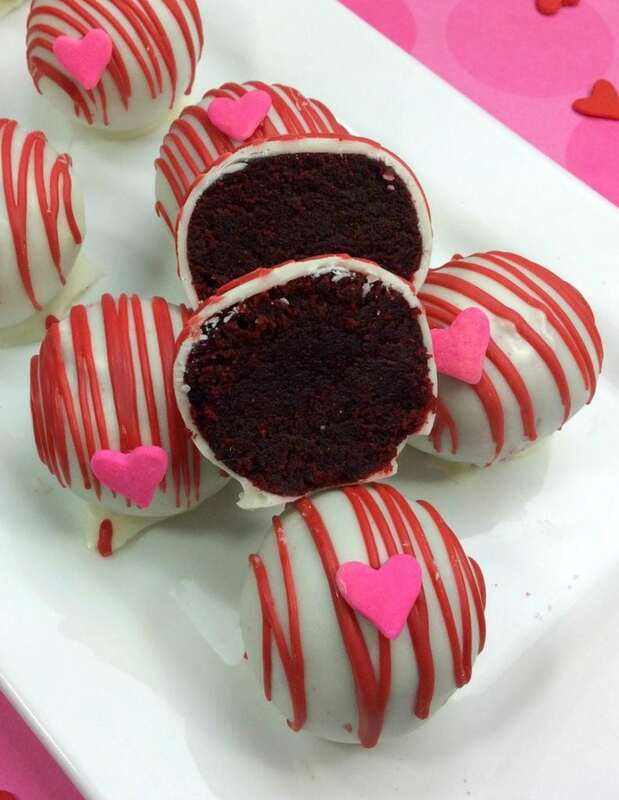 Cut the tip off of the piping bag and drizzle the candy melt over the cake balls. 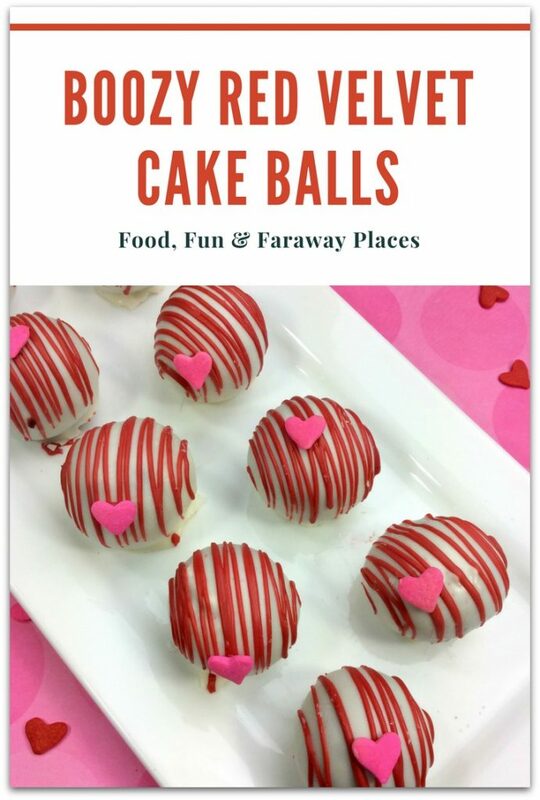 Place a pink confetti sprinkle heart onto the middle of the cake ball. Let sit for 15 minutes before enjoying! Looking for more delicious dessert recipes? You’ll love these classic red velvet cupcakes and these decadent red velvet brownies. I also have a roundup of the best Valentine’s Day cupcakes! Enjoy! Love this boozy dessert post? 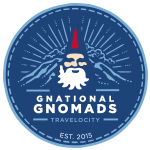 Pin it for later on Pinterest! Need a printable? Grab it below. Looking for a boozy dessert for your next party? 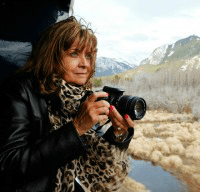 You are going to LOVE this one! 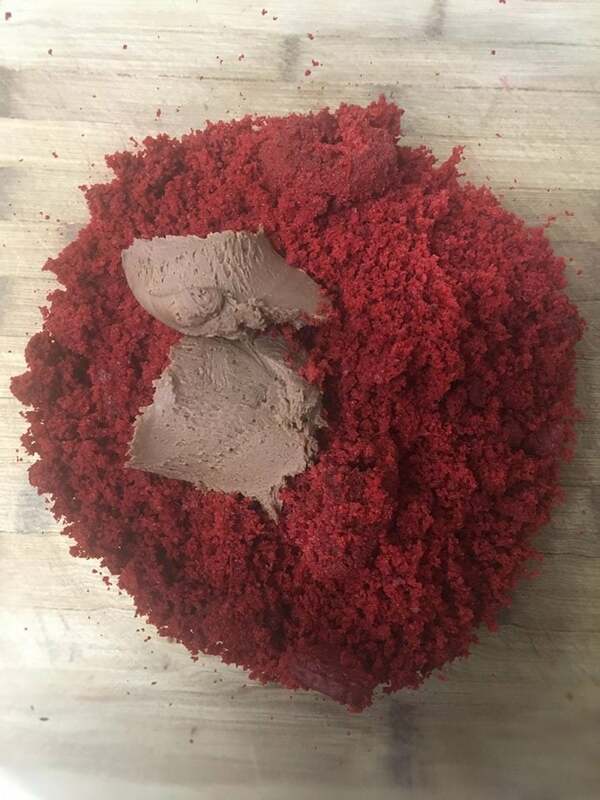 Red velvet cake spiked with spiced bourbon whiskey will be the biggest hit at your party or the best dessert at that party you're planning to attend! 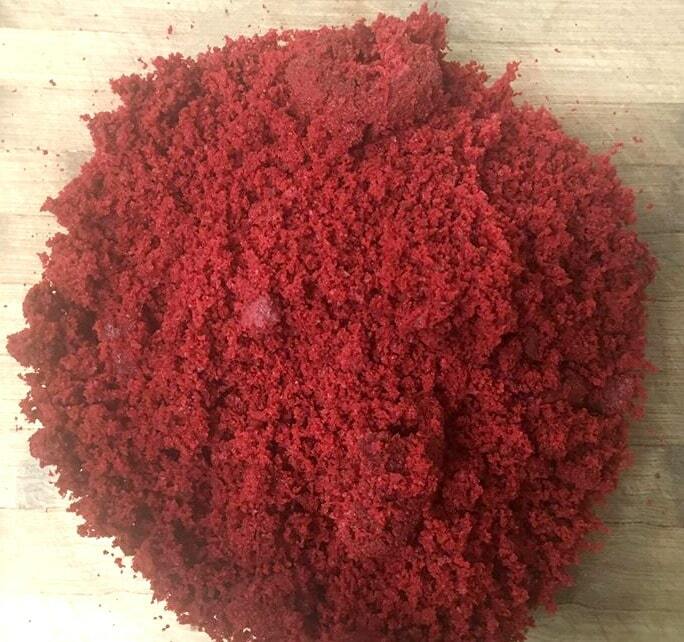 1 box red velvet cake mix You will probably need eggs and oil. Amounts may differ for different mixes. Prepare cake batter as directed on the back of the box. Mix in the 2 Tbsp of the spiced bourbon whiskey. Once cupcakes have been baked and cooled, peel bake the cupcake liners. Crumble only about 10 cupcakes. Using a small ice cream scoop or a tablespoon, scoop some of the mixture into your hands and roll into a ball. Wash out your double boiler and dry very well. If you've worked with chocolate before, you know water will change how it reacts. Pour about 1/4 of the red candy melt into the double boiler. Yummy. But I may not want to.share them. That’s understandable, Melissa! LOL. Enjoy! Thanks for taking the time to let me know! Enjoy! if you will follow these steps then your problem is solve. wow, the cakes are really delicious and attractive, look at me I wanted to try this cake.